Vinyl Renu will restore color to faded vinyl siding. The results are amazing. 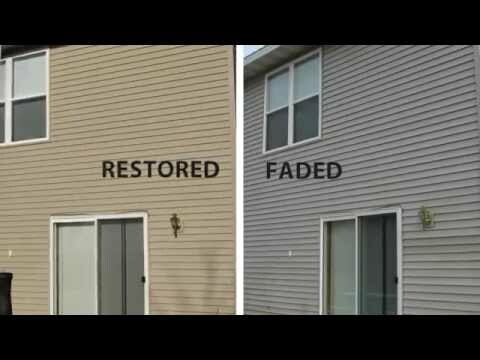 Watch these videos to see how you too can restore color to faded vinyl siding and improve the curb appeal of your home while potentially increasing its value. For more before and after photos showing how you can restore color to faded vinyl siding you can visit our Before and After pictures page be clicking on the Reviews Button at the top of the page. Vinyl Renu was developed specifically to restore color to faded vinyl siding as well as to protect the siding from fading for years. Not only does Vinyl Renu restore color to faded vinyl siding but it also helps resist mold, mildew and algae growth on your siding. Vinyl Renu Professional Grade Cleaner Concentrate will make removing unsightly mold and algae stains from your siding prior to applying Vinyl Renu. Vinyl Renu Cleaner is recommended by vinyl siding manufacturers and is specifically formulated to remove oxidation as well as stains from biological growth like algae and mold.